US Defence Secretary James Mattis has said military police at the border with Mexico will be unarmed and will not have the power to carry out arrests. "They don't have guns in their hands, there is no armed element going in," Mr Mattis told reporters on Wednesday. He said the military deployment along the Mexican border was to help protect border officials from possible threats. A convoy of almost 3,000 Central American migrants has arrived at the Mexican border city of Tijuana. But President Donald Trump has described the caravan of migrants hoping to cross into the US as an "invasion", and deployed about 5,800 troops to the southern border to "harden" it. What is the caravan and why does it matter? On Wednesday, Mr Mattis told reporters that the Department of Homeland Security (DHS) had not requested that troops use "lethal force", adding: "Relax, don't worry about it." He said troops, armed with batons and shields, may be given powers to temporarily detain migrants for "minutes, not even hours", but not the authority to arrest them. "If someone's beating on a border patrolman, and if we were in a position to have to do something about it, we could stop them from beating on them and take them over and deliver them to a border patrolman who would then arrest them," he said. 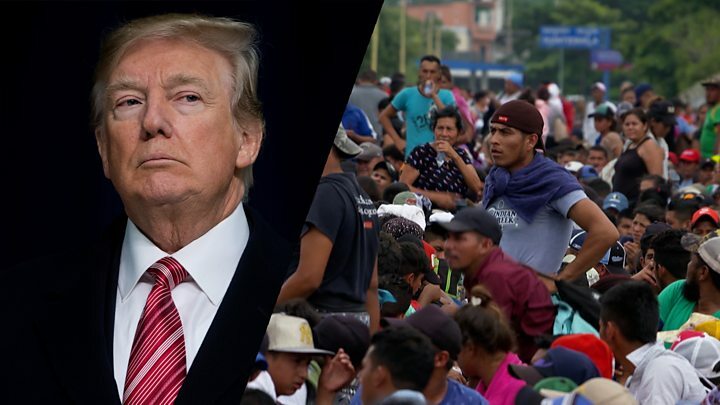 Earlier this week, a US federal judge blocked an order issued by Mr Trump to deny the possibility of asylum to migrants crossing the southern border illegally. What do the migrants want? The migrants say they are leaving their respective countries in the hope of building a better future for themselves and their families. Some say they have been threatened or mistreated by criminal gangs operating in their hometowns. Many are travelling with their children whom they do not want to fall prey to the gangs. Others hope to get jobs abroad which pay enough for them to send money to their relatives who stayed behind. Many say their dream is to reach the US. Some of them have relatives there already whom they hope to join, others have chosen it as their destination because they think they will earn higher salaries there than in Latin America. While Central Americans have long fled their homelands for the US and have sometimes joined forces along the way, the organised nature of this caravan is relatively new. Migrants are often kidnapped by people traffickers and drugs gangs which force them to work for them. A large group such as this one is harder to target and therefore offers more protection.